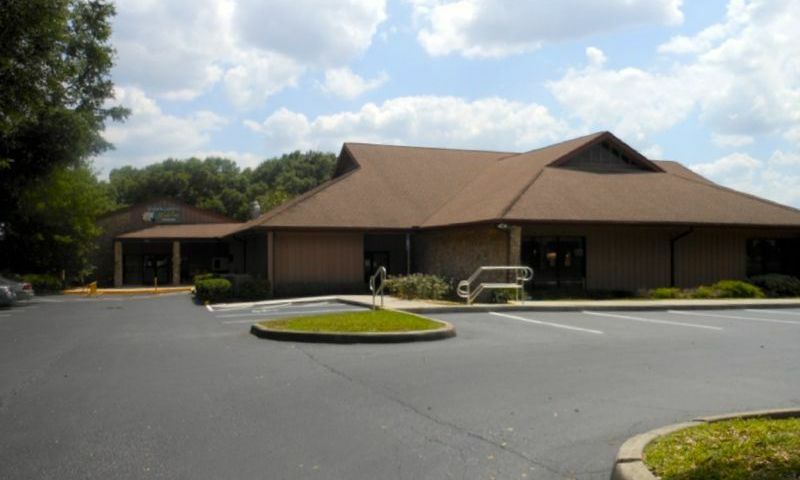 Marion Landing is a 55+ community located in Ocala, Florida. This active adult neighborhood consists of 600 single-family homes available on a resale-only basis. Marion Landing has a charming clubhouse that provides residents great amenities and endless options for fun and entertainment. Residents enjoy a low-maintenance lifestyle thanks to an established homeowners' association within a quiet neighborhood setting. Marion Landing is close to everyday conveniences like shopping, restaurants, medical facilities and attractions. Residents are also near SW Highway 200 and Interstate 75 and within driving distance to Gainesville, Leesburg, Orlando, and Tampa. Marion Landing's clubhouse, known as the Lifestyle Center, offers a wide array of amenities that keep residents physically fit and socially engaged with neighbors. The Lifestyle Center offers an exercise room that provides cardiovascular and weight-training equipment that allows homeowners to stay in shape. They can get creative in the craft room or dance the night away in the ballroom. Residents can challenge friends in billiards or aim for a strike in the eight-lane bowling alley. Residents can have fun with all of the outdoor amenities as well. They can swim in the pool, soak in the spa, or relax on the patio. For more action, homeowners can practice their athletic skills at the tennis, bocce ball, or shuffleboard courts. For some peace and quiet, homeowners can sit by the stocked fishing pond and take in the scenic views of the neighborhood. R.V. parking is also available for residents in the community. Marion Landing was built between 1980 and 2004. The community consists of 600 single-family homes available on a resale-only basis. They range in size from approximately 864 to 2,400 square feet. Homes have two or three bedrooms, two bathrooms, and an attached two-car garage. Some homes were built with frame and vinyl construction while more recent homes used block and stucco materials. Residents of Marion Landing enjoy a low-maintenance lifestyle. An established homeowners' association (HOA) handles tedious exterior-home chores. An affordable monthly HOA fee covers water, sewer, access to all amenities, and common area maintenance. The HOA fee also includes curbside trash pick-up that is scheduled twice a week. Marion Landing provides a great selection of events, activities, and classes that allow homeowners to maintain a social lifestyle. Residents can take Zumba or other fitness classes with neighbors to stay in shape, or go line dancing. They can play cards, bingo, tennis, or shuffleboard any day of the week. Homeowners can find weekly social events happening in Marion Landing that will keep their calendars full of fun things to do. Centrally located in Ocala, Florida, Marion Landing is near plenty of everyday conveniences. Residents have easy access to Interstate 75 and SW Highway 200, which makes driving around town a breeze. Paddock Mall, Walmart, Publix, Target, and Sam's Club are minutes away for all of your shopping needs. Medical facilities like Ocala Regional Medical Center, West Marion Community Hospital and Munroe Regional Medical Center are all less than ten miles away. When traveling farther is necessary, Orlando International Airport is 90 miles away and Tampa International Airport is 100 miles away. Marion Landing in Central Florida is a well-established active adult community that has everything 55+ homebuyers would want or need for a low-maintenance lifestyle. There are plenty of activities available in Marion Landing. Here is a sample of some of the clubs, activities and classes offered here. Marion Landing was built between 1980 and 2004. The community consists of 600 single-family homes that range in size from approximately 864 to 2,400 square feet. Homes have two or three bedrooms, two bathrooms, and an attached two-car garage. Some homes were made with frame and vinyl construction while more recent homes used block and stucco materials. Please Note: Floor plans are not available at this time. We have lived in Marion Landing for nine years and it's going to take a major catastrophe to get us out of here. We moved from up north and our neighbors soon came to visit. These neighbors liked Marion Landing so much they put their house up for sale and now live two blocks away and we are still best friends. I found out later on it's not unusual to have former neighbors follow new residents here. Our amenity fee runs the lowest of of surrounding communities because we manage ourselves with board members elected from community volunteers. We even have our own bowling alley that's free to residents (included in your monthly amenities). And if you can find a friendlier community in Florida, I'd like to visit it. This community goes out of its way to help others. We have a major hospital 3 miles away with cardiac rehab on the grounds with another hospital ready to be built. And there is an 'urgent care' facility 1/4 mile outside our main access road. The part of Marion Landing we live in has speeders & loud cars go by. Someone said Marion Landing is like a family. I had open heart surgery in March, & didn’t get flowers or cards like they say they give. I seen in our Marion Landing little monthly booklet that people thank him for their flowers & cards. They must give to who they want to. Also, seen in the realtor part of the newspaper that you don’t have to be 55+ to own a house in Marion Landing. So much for a 55+ community. A little over a year the trash pickup has changed to once a week now, HOA fees went up, water usage was lowered. Well we have house on 60th cr. That has been empty for at least 10 years. A bank supposedly owns the house our is keeping it in some kind of bogus holding. It's over grown with bushs and other vegetation. It is an eye sore. Marion Landing Association is doing little if anything to get this house on the market. I looked at several. locations. This place gives you the most for your money. Very friendly community. Great location. 55places.com is not affiliated with the developer(s) or homeowners association of Marion Landing. The information you submit is distributed to a 55places.com Partner Agent, who is a licensed real estate agent. The information regarding Marion Landing has not been verified or approved by the developer or homeowners association. Please verify all information prior to purchasing. 55places.com is not responsible for any errors regarding the information displayed on this website. 8457 SW 65th Avenue Rd.